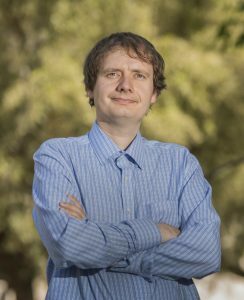 ​I am an Assistant Professor in the Department of Physics, University of California, Davis, and a founding member of Center for ​Quantum Mathematics And Physics (QMAP). I did my undergraduate study at Institute of Particle and Nuclear Physics of Charles University in Prague in 2008. I got the PhD degree from Princeton University in 2013 under the supervision of Nima Arkani-Hamed. Then I was a Prize postdoctoral fellow at Walter Burke Institute at Caltech. In 2015 I started as an assistant professor and founding member of QMAP at UC Davis. My research interests are: quantum field theory, supersymmetry, and string theory. I am working on exploring new mathematical structures in scattering amplitudes, mainly in the context of maximally supersymmetric gauge theory and gravity. Recently, we found that in the planar limit of N=4 Super Yang-Mills theory the amplitudes can be calculated as volumes of Amplituhedron (see nice review in Quanta magazine or the New Scientist). Currently I am working on the extension of this picture to other quantum field theories. Research: My CV and list of publications. Recently, I have been working on the further mathematical understanding of the amplituhedron which resulted in a paper with Nima Arkani-Hamed and Hugh Thomas. In another paper with Jake Bourjaily and Enrico Herrmann we used a refined version of unitarity methods to calculate higher loop integrands in planar N=4 SYM theory. In the other project I looked at vector effective field theories from the amplitudes perspective and we found Born-Infeld as a special theory. Awards: In 2018, I was awarded Young Scientist Prize in Particles and Fields from the International Union for Pure and Applied Physics (IUPAP). I also received UC Davis Award for Innovation and Creative Vision, read article here. Amplitudes Summer School: In June 2018, I organized Amplitudes Summer School as the QMAP event at UC Davis. It was followed by the conference Amplitudes 2018 at SLAC. Teaching: In the winter term 2018/2019, I will teach Physics 9B and in the spring advanced graduate course.